A classic looking slot with familiar fruit symbols and diamond accents, Deco Diamonds offers an updated spin on a familiar layout. Gem-filled games have been wildly popular over the years, so it’s no surprise that Microgaming decided to infuse diamonds into a slot game with nostalgic undertones. The result is a smash hit in the making with an Art Deco style, jazzy music, and special features that keep players coming back for more! Deco Diamonds offers the usual fruit and bell symbols with an Art Deco twist, giving it a smart look any slot enthusiast will appreciate. You’ll enjoy classic symbols on the reels, including lemons, cherries, peaches, watermelons, 7s, bells, and diamonds. The gold tone Deco Diamonds logo serves as the Wild symbol, along with the clearly marked Wild Diamonds symbol. In keeping with the “deco” vibe, there’s an upbeat, jazzy soundtrack that enhances gameplay and makes those big wins even more thrilling. Each fruit boasts glistening diamond seeds to reflect the gemstone theme. Between the glitzy diamonds and Art Deco font, Deco Diamonds has an upscale, retro vibe reminiscent of Old Hollywood, which certainly sets it apart from most modern slots. 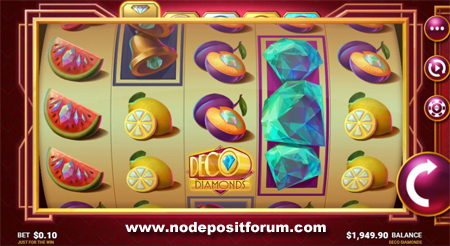 Deco Diamonds is a five-reel slot game with nine pay lines. Naturally, the diamond is the highest paying symbol, awarding 100x your bet if you land five in a single pay line. Diamonds also substitute as Wilds for all symbols. The slot is considered a high volatility game with an RTP of 96.03 percent, but lucrative symbols pay big, resulting in decent payouts for players who hit diamonds during the base game. In fact, the slot can reward you with up to 2,323x your stake, which can occur if you land wins on each Re-Spin as well as the maximum prize on the Bonus Wheel. Bets start as low as 10p and go up to £50 per spin. There’s even an Autoplay feature if you prefer hands-free play. Deco Diamonds offers two bonuses features. The Deco Diamonds Re-Spin is triggered when two, three, or four Deco Diamond symbols appear on the reels. This scenario will give you one Free Re-Spin and hold all Deco Diamond symbols for the remaining spins. If you get more Deco Diamond symbols, you get more Re-Spins until no new symbols appear on the reels. The most exciting feature in the game is the Bonus Wheel, which is triggered when you get three, four, or five Deco Diamond symbols in the main game. The Bonus Wheel feature includes three levels: Silver, Gold, and Diamond. Three Deco Diamonds get you to Silver, four get you to Gold, and five access the Diamond level. Each level denotes the amount you can win during each round, but even if you trigger a lower level, you can still level up within the Bonus Wheel by landing on the Level-Up tile. The Bonus Wheel spins automatically and pays out based on where it lands. The maximum amount you can win at the Diamond level is 1,000x your original bet. If you love classic slot games with sticky reels, lucrative bonuses, and upbeat sound effects, Deco Diamonds, developed by Just For The Win and available are Microgaming casinos such as Lucky Emperor, is right up your alley. The game boasts a glitzy finish that harkens back to an old-world era complete with all your favorite fruit and bell symbols. With the ability to win up to 1,000x your stake and level up for bigger prizes, Deco Diamonds offers an exciting twist on nostalgic gameplay that shouldn’t be overlooked, making it one of the biggest debuts of 2018. Whether you prefer playing slot games on your computer, tablet, or smartphone, the engaging gameplay Deco Diamonds offers will not disappoint!